Marvel’s Spider-Man line of titles has become one of the best places for fans of female superheroes to find stories about badass women with gorgeous art. 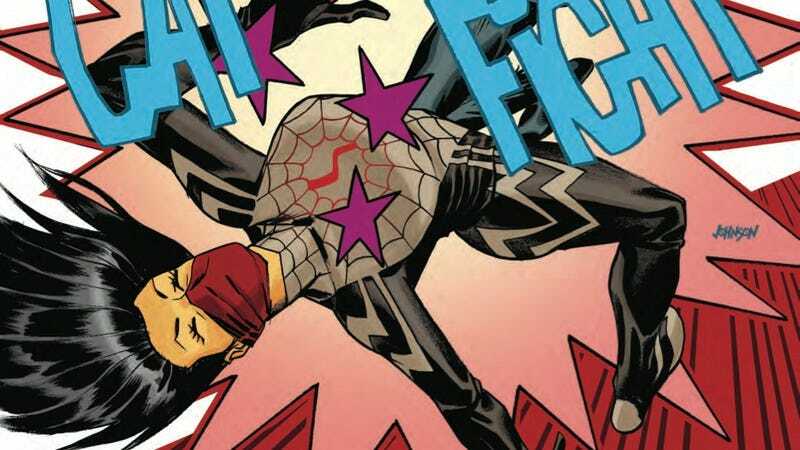 Spider-Gwen and Spider-Woman have offered exciting, fresh takes on established characters, while Silk has given a newer character the opportunity to shine on her own, presenting writer Robbie Thompson and artist Stacey Lee with a relatively blank slate to create their distinct take on a Marvel superhero. One of the things that differentiates Silk from the other two titles is that it features a woman on the creative team, and Stacey Lee’s art has quickly become the main reason to check in on the adventures of Cindy Moon. This preview of Silk #3 spotlight the sleek linework and dynamic composition that have made Lee’s art so engaging, and she brings a lot of character expression to these action-packed pages. The opening splash page depicts a demolished cubicle with intense detail, and that attention to a fully-realized environment helps ground Cindy’s world as her superhero alter ego fights a blue dragon guy in the sky. That battle is given a lot of energy by Ian Herring’s coloring, which incorporates a wide spectrum of bright colors to accentuate the different beats of the action, and he modulates his palette to fit the shifting atmosphere of Lee’s art as the story jumps between Cindy’s civilian and superhero lives.